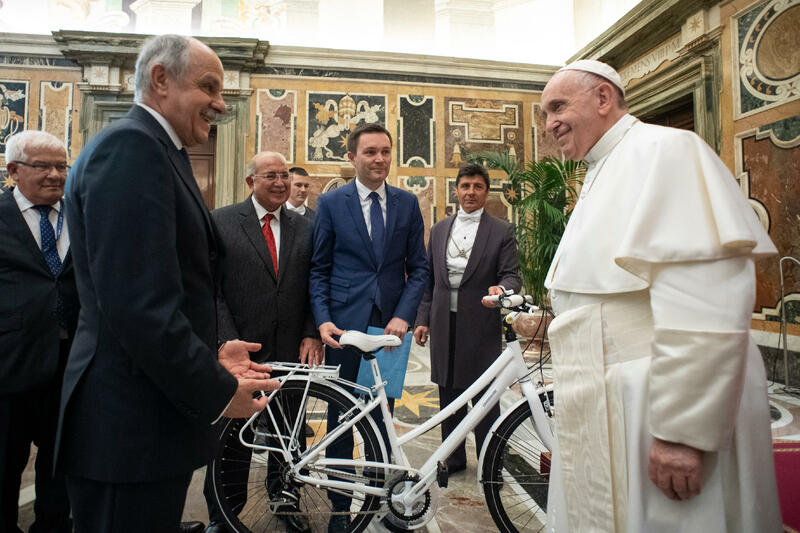 Pope Francis on March 9, 2019, cited the example of cyclists for integrity and consistency – and giving their best in the sport. His comments came in the Vatican’s Clementine Hall where he received the participants in the Annual Congress of the European Cycling Union, which on this occasion is also hosting the Assembly of the African Cycling Confederation. I am pleased to welcome the participants in the Annual Congress of the European Cycling Union, which on this occasion is also hosting the Assembly of the African Cycling Confederation. I especially greet the President of the International Cycling Union, Mr. David Lappartient, and thank him for his words. The relationship between the Church and sport has a long history, which has become ever stronger over time. Sport can be a great help to the human development of all, encouraging them to give of their best, as they seek to attain a certain goal. This is because sport teaches perseverance, sacrifice, and self-denial. We can think, for example, of the long and demanding training or the observance of a strict discipline of life. The practice of a sport also teaches us not to be discouraged and to start again with determination after a defeat or injury. Sport often becomes an opportunity to express with enthusiasm the joy of living and the true satisfaction of having crossed the finishing line. Cycling, in particular, is one of the sports that places emphasis on some of the virtues, such as patience in effort, on long and difficult climbs; courage, in trying to break away or making a sprint; integrity, in respecting the rules; altruism and team spirit. Indeed, if we consider road cycling – one of its most common forms – we can see how the whole team works together during the races: the support riders, the sprinters, the climbers. They often have to sacrifice themselves for the leader, and when a teammate experiences difficulty it is the other teammates who show support and accompaniment. In life too, it is necessary to cultivate a spirit of selflessness, generosity, and community in order to help those who have fallen behind and who need help to achieve a certain goal. Many cyclists have been examples, in sport and in life, for their integrity and consistency, giving their best in cycling. In their careers, they have known how to combine strength of mind and determination to achieve victory, but also solidarity and joy of living in bearing witness to having discovered the potential of the human being, created in the image and likeness of God, and the beauty of living in communion with others and with creation. Athletes have this extraordinary opportunity to communicate to everyone, especially young people, the positive values of life and the desire to devote it to the pursuit of high and noble goals. This helps us understand the importance, for anyone who practices a sport – from occasional participants to amateurs or professionals – of always being able to practice it at the service of the growth and integral development of the person. When the opposite takes place and sport becomes an end in itself, and the person an instrument at the service of other interests such as prestige and profit, then distortions appear that taint it. I am thinking of doping, dishonesty, disrespect for oneself and one’s opponents, and corruption. I would also like to say a word about new developments in the field of cycling, which are spreading among the younger generations and which, like all new developments, can arouse resistance and represent a challenge for more traditional disciplines. The commitment that the Church has undertaken to listen to young people, to take to heart their expectations and their ways of expressing their desire to live and fulfill themselves is also beneficial for you. It is necessary to accompany new generations without losing sight of the healthy traditions and popular culture that, in many countries of the world, accompanies cycling and its champions. I wish you a fruitful meeting during these days, and in asking you to pray for me, I impart to all of you my heartfelt blessing. Thank you.